Diablo III's Third Class - The Wizard! 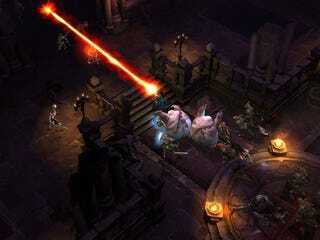 At the BlizzCon 2008 opening ceremonies, Blizzard CEO Mike Morhaime introduced players to the newset class for Diablo III, the Wizard. Portrayed as a rather attractive female duing the footage shown, the Wizard used fire, lighting, and ice to take on the hordes of the undead, much like a mage from World of Warcraft. Check out the first screenshots below, including one where she uses that old Ice Mage staple, Frost Nova. Yum!